How can craft producers take advantage of the Internet and e-commerce opportunities to sell their goods and benefit their families and communities? This study, funded by the UK Government Department for International Development (DFID), examined e-commerce opportunities for craft producers. The research project aimed to focus the main part of its activities on capturing the experiences to date of actual producers in India and Bangladesh; to assess their felt needs, and to present groups with options to enable them to use the Internet and e-commerce for sustainable development of small businesses. While the research necessarily also involved a number of existing 'Northern' UK/US trading organisations, the research was not focused on their institutional needs, but on those of the producers themselves. The research was intended to be enabling for these groups, and aimed to present options to empower them with appropriate and locally-owned technology. The report identifies the most common barriers to success, and makes recommendations for best practise. 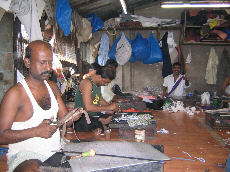 Furthermore the report discusses handicraft production as an option for the urban poor concluding that while ICT may enhance the livelihood strategies of the poor by timely provision of information and communication, they are unlikely to significantly affect the trends of handicraft production. Producers will continue to be among the poorest of a community and be vulnerable to market trends.